I learned a lesson in this area when I built my first instructional talk. After years of helping teammates, managers, and executives prepare conference presentations, I finally had an opportunity to give one of my own. I spent weeks creating storyboards, illustrating concepts, and practicing in front of peers. When it came time to submit my slides to my company’s legal team for review (most largish corporations need to review any talk given be an employee, even if it’s not company-specific), I sent in my handcrafted presentation with confidence. But the legal team rejected it. Because I’d made an embarrassing mistake: I hadn’t gotten permission for a few app screenshots I’d included as supporting examples. For someone who considered herself pretty knowledgeable about creative copyright protections, I was ashamed to have been so naive about this area of rights management. It turns out this isn’t so uncommon. Many speakers honestly don’t know that screenshots and app recordings are rights protected, since they are relatively young additions to the copyright space. Other speakers might know but are willing to take the risk because it’s too time-consuming to ask (or they don’t know how). It might also be argued that some uses fall under fair use. But using these assets in presentations without approval is risky from a legal perspective, so why take the chance if you can avoid it? Back to my first presentation: it was annoying to have to go back to the product owners and ask their approval for each screenshot. However, it turned out to be a beneficial experience. Getting approval made me feel more confident about my content. And it even helped me forge relationships with some of those product teams, who were more than excited to help raise awareness about my upcoming talk when they knew their work would be a part of it. I’ve since made permission-gathering a core part of my presentation design process. In this post, I’ll share some techniques I’ve found helpful for requesting permission specifically for screenshots and screen captures used in presentations. Hopefully they’ll make permission-gathering seem more accessible, and help you make rights-gathering a core part of your presentation design process. Once you have a presentation outline or rough idea of your topic, start collecting any 3rd party screenshots you might want to use to illustrate your points. Having an early idea of the examples you might use helps you plan out how much time you might need to allocate for asking for permission later. I usually find several examples from different products that illustrate the same point, so that I have backup options in case my preferred product screenshot is not approved. Before you start fitting specific screenshots in your presentation, understand what uses are generally more acceptable to content owners. Some uses might be problematic and be grounds for denial of permission. For example, many companies will not approve of you image editing their screenshots. Some cropping and scaling may be OK, but blurring, obscuring, or drawing over content is likely a deal breaker. Consider it from the product owner’s perspective: they don’t want you representing their content in a false manner. Using screenshots in a negative way can also be a deal breaker for companies. You may be excited to find a site that has a terrible example of a web form for your talk about making forms more usable, but, for some companies, this usage might be considered defamatory. Of course, you can still ask companies for permission if your screenshots are used in these ways. Some companies are just fine with being used as a negative example. Just be specific about how you’re using these assets when you request approval, and know that these uses are more likely to be denied than screenshots that are unedited and used in a positive light. When you’ve identified the screenshots and captures you want to use, you can check if the product company already has guidelines about using them. Some larger companies put guidelines on their websites because they can’t respond to every request. These guidelines will tell you if there are uses that don’t require permission, uses that are prohibited (or if all use is prohibited), how to ask for approval, and how to write the credit text for attribution. For companies that don’t post specific guidelines, or if you have additional questions, email is generally the best contact method. Usually you need to reach out to the PR department (“pr@company.com”). Be prepared to attach the screenshots or recordings you want to use, or even the slides in question. Subject: Permission to use [product name] screenshots in an instructional presentation? Please let me know if I have your permission to use these images in this way and if you have any questions! Some screen captures may include content not owned by the product company. An example might be screenshots of social media apps that include posts made by others. Unless the product company has worked out licensing agreements with their users, you will also need to ask for permission from each of those content owners if your screenshot includes their work. When I used a screenshot of a Dribbble search results page, I got permission not just from Dribbble, but from each of the artist’s whose artwork was shown as a thumbnail in search results. I found each person’s contact information from their profile page and emailed them using my standard request template. You can avoid this sort of situation by only taking captures of social media screens of your own content. News sites are harder to work around, and you may not be able to get permission to use screenshots that include photos from AP photographers without paying for expensive licensing agreements. It’s best to request permission about 2 weeks before your planned use. This gives busy companies and startups enough time to respond to your request or ask clarifying questions. Some will answer quickly, some will be slower. If a company gives you permission in response to an email request, hold onto that message. I filter all of my approval emails into a “permissions” folder and also archive offline copies. This makes it easy to find those approvals if anyone questions your use of this content in the future. When a content owner provides permission, it comes with the expectation that you’ll add a line of attribution on the slide(s) on which the content appears. The attribution line is typically some variation of: “Screenshots © 2017 [Company name]. Reproduced with permission. All rights reserved.” Defining a slide template with space set aside for attribution has helped me easily swap 3rd party screenshots in and out of my presentations with little fuss. 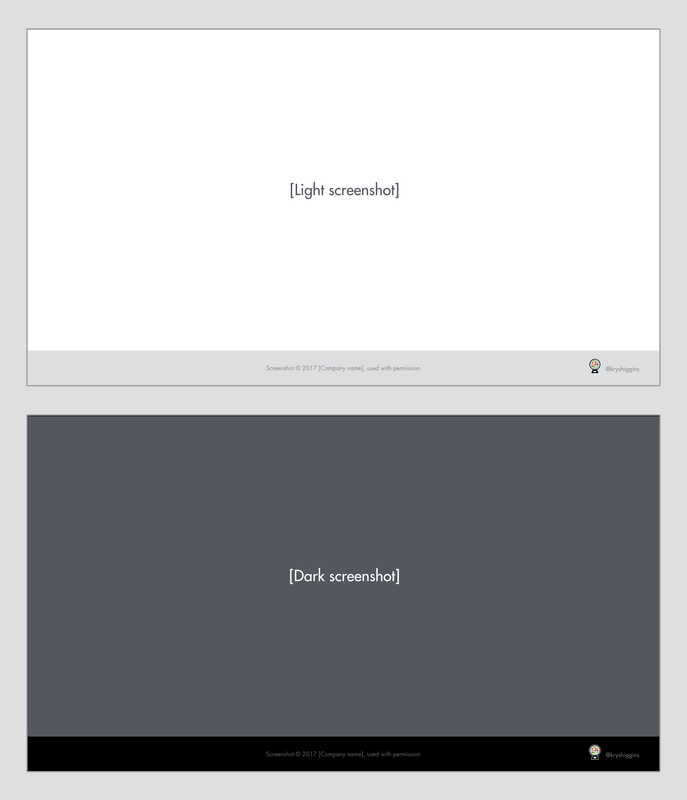 Example of slide templates from one of my presentations with a line of attribution at the bottom. The attribution line may vary based on owner preferences. About 90% of the product owners I’ve asked permission from have been happy to grant it when I followed the steps above. But there are the occasional people who never respond to a request, or who decline to grant permission. Either of these circumstances means you do not have explicit permission to use the screenshots or product recordings. I have pulled content for these reasons before. And while less likely, it’s possible a company might rescind their permission at a later date. It’s always good to be prepared for these eventualities and it’s why I suggest having multiple backup options for each point you want to illustrate with an example. I hope the process I outlined above makes the idea of getting permission for screenshots and recordings seem more tenable for you. While it seems like a bit of work the first time you go through it, it can really make a difference in the long run.